Salman Abu Sitta, a Kuwait based researcher. 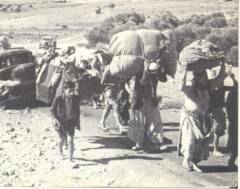 These pictures are among the very few published pictures of the expulsion of Palestinian refugees in 1948 known in Arabic as al Nakba. No doubt, hundreds of pictures have been taken by Israeli soldiers and others, but they are still kept confidential, either in official archives or in private collections. Picture number one, appeared in Charles Smith, "Palestine and the Arab-Israeli Conflict", Bedford/St. Martin's, Boston, New York, 2001, Fourth Edition, p.205. The caption says it is taken near Beer Sheba in October 1948, however, the dress is definitely not typical of Beer Sheba. Very likely it belongs to villagers in the central area or lower Galilee. The trees in the background are common in the north. The time of the year is typical for late Oct. or early November, as can be seen from the condition of the grass (foreground) and the clouds. This is the period when Hiram operation was launched against Galilee, in which about 7 out of reported 35 massacres were committed. Typically, the men were taken aside; about 50-200 young men were shot, the rest were taken to a detention center where they were ordered to bury corpses and remove rubble of demolished houses. 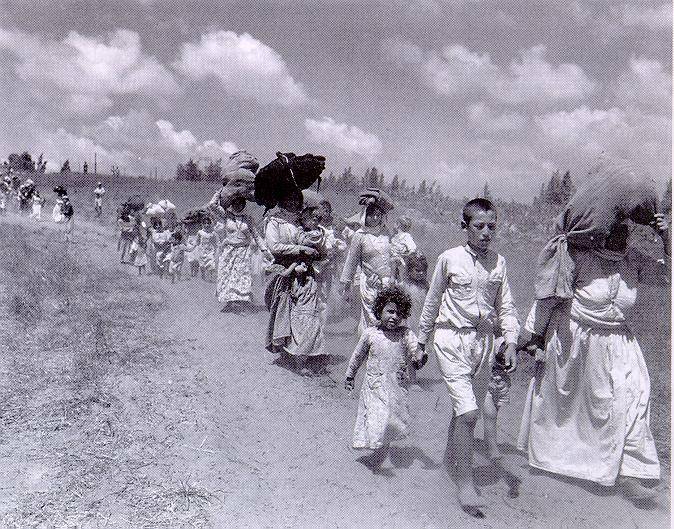 Women and children were directed to march northward to Lebanon or eastward toward Jenin. Womens' valuables were looted by the Israeli soldiers on the road. 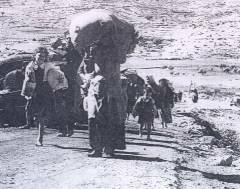 The photograph depicts one of these scenes : women and children are marching forward with somber looks on their faces, carrying their belonging which have been hastily collected. (Usually they are given one hour to pack). The boy in front, with white sirwal, must have barely escaped attention, as he is around 12. All others are younger children or women. 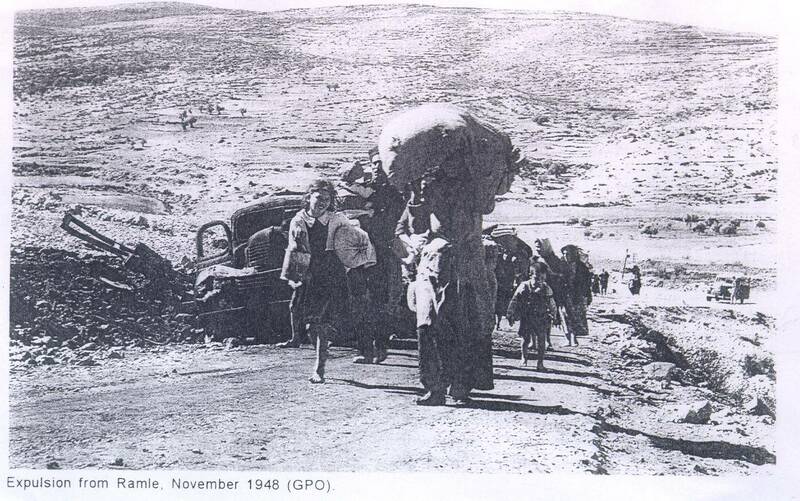 At the beginning of the trail (upper left), two Israeli soldiers, at either side, are pointing their guns at the expelled refugees. The one facing the photographer, is dressed in white, the other in dark uniform, or may be this is the light. Three other soldiers (two and one) can be seen at the horizon. It appears that about 5-6 Israeli soldiers are directing the flow of the refugees out of their village, which could have been just behind the trees. The person who took the picture must have been standing at an elevated place, probably in a jeep. It is interesting that nobody looks at the photographer, although he is standing at the edge of the trail. No doubt this is out of fright, especially if women have just seen, or heard, that their loved ones were shot an hour ago. The somber look on the boy's face (in front) is an indication. But his younger sister, with her child's innocence, is the only one who is curious enough to look at this foreign man. I wonder where she is now. 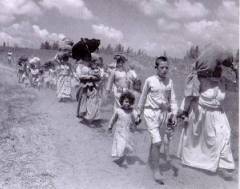 Probably she is a grandmother of about 58, telling her grandchildren how she, on a fateful day in the autumn of 1948, saw blood, death and destruction, and then, with Israeli guns pointed at her, she had to walk on her little bare feet so many kilometers to start the journey of exile. This photo is related to photo number three. It was Fred Csasznik, on the other side of the road, on the same spot. It is shown on the cover of Benny Morris's "The Birth of the Palestinian Refugee Problem, 1947-1949", Cambridge University Press, 1987. Here you see the same wrecked truck (lorry), directional post and the (Israeli) soldier standing next to his car at the road junction. 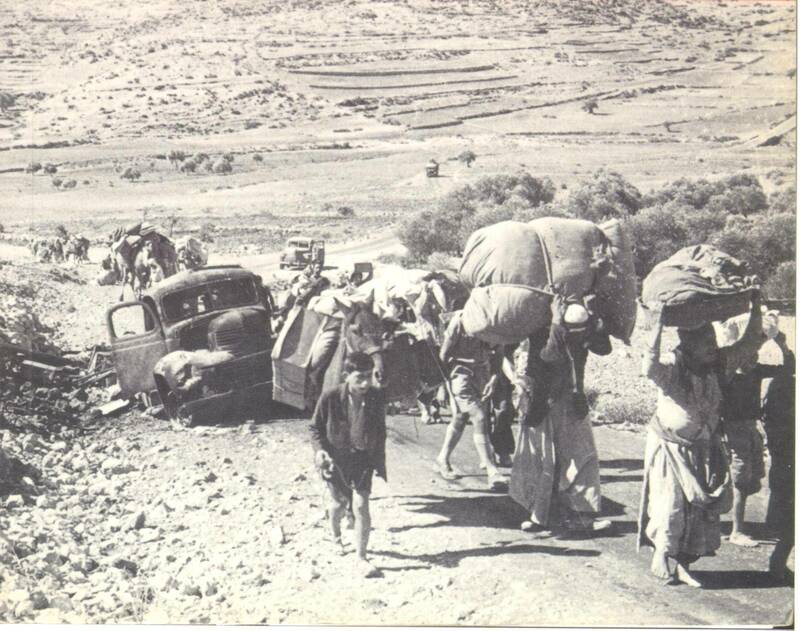 Here the expelled refugees are mostly villagers, carrying heavy loads on their backs, on their donkeys and camels. The refugees are converging on the road allowed for exit from the left with their animals, and from the right in a bus or truck, some are sitting at the top. The bus or truck is not unlike the wrecked one. (The typical Israeli expulsion procedure is to block 3 sides of each village and leave the fourth open). Picture number 3 Expulsion from Ramle Not! is taken minutes after Morris's and on the other side of the road, by the same photographer. This can be seen from observing the same man behind the school girl in your photo. He appears to be a disarmed Policeman, wearing his cap and in uniform, carrying a child. This same man appears (earlier) in the middle of the crowd in Morris's. Perhaps by then the bus/truck unloaded his passengers which included those two town women in your photo. The caption "Expulsion from Ramle" is incorrect. The population of Lydda and Ramle (70,000) were expelled in the most clear terms on order by Yitshaq Rabin with approval from Ben Gurion. That was on 12/13 July 1948.